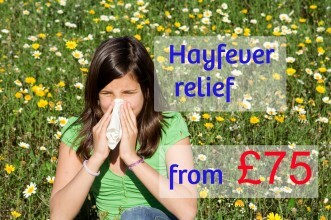 If you suffer from hayfever and are getting limited relief from tablets, eye drops and nose sprays then you could be classed as having severe hayfever. We do advise most of our patients to try and take a few forms of anti-histamine medications, but if these are not working then the injection may be a solution. The injection’s active ingredient is triamcinolone which is a steroid. When injected into a muscle, usually the buttocks, this causes the body to reduce it’s production of histamine in response to allergens such as tree and grass pollen. Whilst this injection reduces the response to common allergens, it can also theoretically reduce the bodies response to fight normal bacterial and viral infections too. This can be discussed with one of our doctors in an appointment. The injection comes with risk factors associated with having oral tablets, and the effect of the steroid injection usually lasts the whole of the hayfever season. In the vast majority of our patients, one injection a year poses little risk to the body. As with any prescribed medication a detailed medical history and consultation will need to be undertaken with one of our doctors prior to the injection where all the risks and benefits will be discussed with you in detail.